Changes from the late 50’s are varied and many. The demise of hundreds of small shops was in some ways to change the social structure of Pollokshaws. These shops mainly managed by the owners, who in some cases lived on the premised, were known to all their customers. The new “Shaws” with all it’s merits, i.e. good housing, many people experiencing bathrooms and adequate accommodation, however, the new build has come at great cost, over the years the fabric of the area has been decimated (not too strong a word). The Salvation Army premises and the Old Mans Club fell into disrepair both used by the senior citizens for meals and social occasions and are now unused, one being privatised and the other demolished. Add to this the demolition of three churches, one cinema and four small halls in other ways make the changes even more poignant. During the rebuilding era many of the residents were re-housed in South Nitshill, they hoped to be returned to Pollokshaws, this to their disappointment never happened. There are four licensed premises from the original nine. In the 1950’s a very good restaurant and bar, The Pickwick opened but closed, allegedly, for too many altercations. Two small industrial sites are all that remains of what was once a wealthy centre of engineering skills and garment production. The last employer of large numbers was D & H Cohen who had a workforce of around 1000. At present Pollokshaws has a large number of “Asylum Seekers” who seem to be fitting in quite well, their integration is being encouraged by the use of Computers and English lessons. Now in the private domain are Golf, Tennis and Bowls, Nether Poloc has fine Football, Rugby and Hockey facilities, whereas public domain Bowls, Tennis and Putting once available in Auldhouse Park were closed some years ago. Shopping today is done at two super markets, nearby Shawlands is the venue for various speciality shops but in our “Through Away” society the need for small hardware, haberdashery and wool shops seem to be less in evidence. We have to accept the change in society in Pollokshaws is in common with Govan, Gorbals and other parts of Glasgow, which have been refurbished. We at Pollokshaws Heritage look to the future and hope we can help to make the “Shaws” more user friendly. Pollokshaws has some older buildings soon to be portrayed in a “Heritage Trail” booklet, which sites twenty four places of historical interest. Two worth a mention are the Burgh Hall and Eastwood Church, both gifted by Sir John Maxwell. Benefactor of Pollokshaws they are monuments to his generosity, as are parks, playing fields open spaces giving it a Green Belt. Pollok Country Park has the famous Burrel Collection. Presented to Glasgow in 1944 by the millionaire ship owner Sir William Burrell, the Burrel Collection amassed over some 80 years of his life and is as outstanding in its wealth and diversity as the man himself. There are some 3000 of the 8000 items on displayed at any time and are housed in the specially constructed building which was opened in 1983. 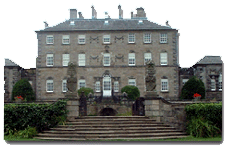 Add to this Pollok House, managed by the National Trust for Scotland. This stately mansion, which stands in the middle of Pollok Park, was given to the City of Glasgow by the then owner Mrs. Anne Maxwell Macdonald, of the Maxwell dynasty, in 1966. Her family had owned the estate for almost 700 years. This heritage in itself has been a great inheritance to the area and people of Pollokshaws.